When I was a kid in the 1970s and early ’80s, processed food was everywhere. I remember TV dinners, fish sticks, Tater Tots, Hamburger Helper, canned pear halves in sugar goo, and more. And that was in my house, where my mom used processed food to supplement her habit of cooking from scratch two or three times a weeks. In at least one friend’s house, heat-and-serve fare seemed to have replaced cooking altogether, starting with an unholy (although quite coveted by me at the time) frozen pancake-and-sausage breakfast product made by Jimmy Dean. 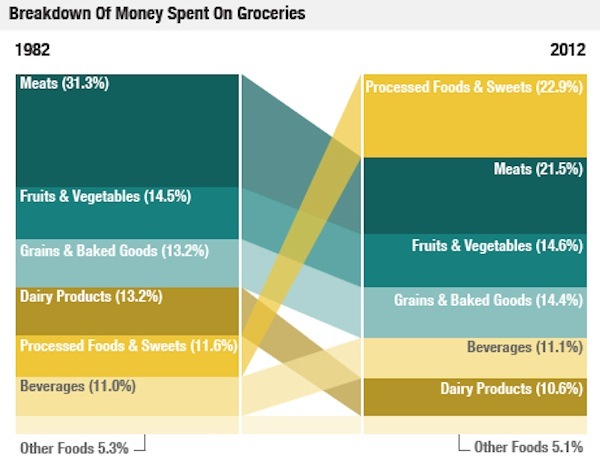 Note that in 1982, we dropped 11.6 percent of our grocery expenditures on processed food, making it the fifth heftiest item in the food budget. Today, we spend nearly twice that, and processed food has edged out meat as our largest grocery expenditure. Our spending on meat as a percentage of grocery budget, meanwhile, has plunged by a third; and most other categories, like fruit vegetables and beverages, were stable. Source: Bureau of Labor Statistics Credit: Lam Thuy Vo / NPRPork chops, chicken legs, steak, ground beef—all have plunged in price. So we’re able to eat more meat while spending less on it than anyone could have dreamed in 1982. Planet Money tapped Stanford economist Walter Falcon for an explanation: “We’ve seen major restructuring in poultry, pork and beef industries that has allowed efficiencies and brought down the cost.” True enough; but one analyst’s “efficiencies” are another’s relentless attack on labor, animal welfare, public health, and the environment. I made that case in a post last year (and make it all the time, I guess). 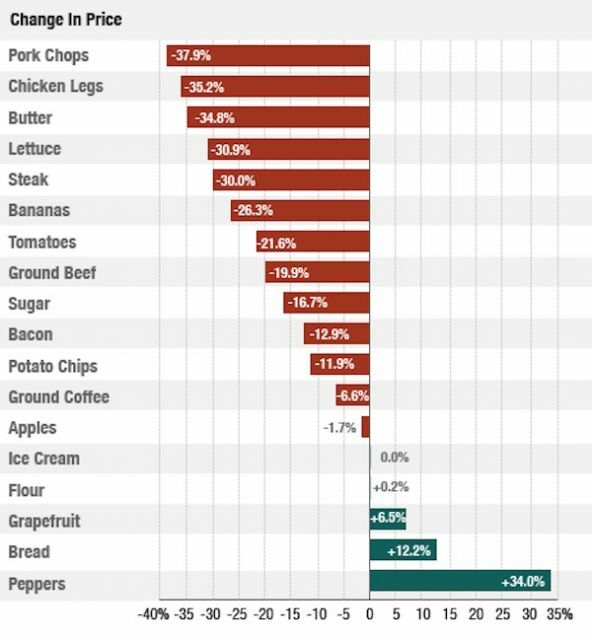 I think the Planet Money charts are telling us is that American eaters have gotten a windfall from the the era of cheap meat that dawned in the early ’80s. Meat prices tumbled as small farms shuttered, to be replaced by massive factory-scale farms that stuffed animals with cheap, subsidized corn and soy and kept them alive and growing to slaughter weight with daily doses of antibiotics. Regulators looked the other way as these gigantic facilities created messes they didn’t have to pay to clean up. Meanwhile, as Mother Jones’ Ted Genoways showed in his blockbuster piece last year on Hormel, corporate meatpackers managed to bust unions, speed up kill lines, and drive down employee wages. It all added up to bargain-priced meat. See how your food spending stacks up to the national average with our handy calculator. Consumers put some of the savings into eating more meat, and shifted some out of the savings out of food purchases altogether (in another chart in the same post, Planet Money shows that in 1982, a little more than 12 percent of our spending went to groceries, while now less than 9 percent does). But what what they mostly did was shift cash that once went to meat into processed food. And according to the Institute of Food Technologists, US consumers are cooking significantly less, not more, than they did in the early ’80s. After all, 30 years ago, nearly three-quarters (72%) of main courses served at dinner were homemade, but by 2010, that total had declined to 59%, according to the NPD Group, which tracks consumer consumption patterns. These are sobering trends—ones that can’t be ignored people working to challenge the power of Big Food and creating functional alternatives to it. Correction: Due to a calculation error, the original version of this article stated that we ate 10 percent more meat now than we did in 1982. The sentence has been corrected.